As warmer weather approaches (yay! ), it’s time to start thinking about digging out the kids’ clothes, bathing suits, and flip flops. This is also my cue to start getting my skin ready for the sun. Why not wait until the first beach day? 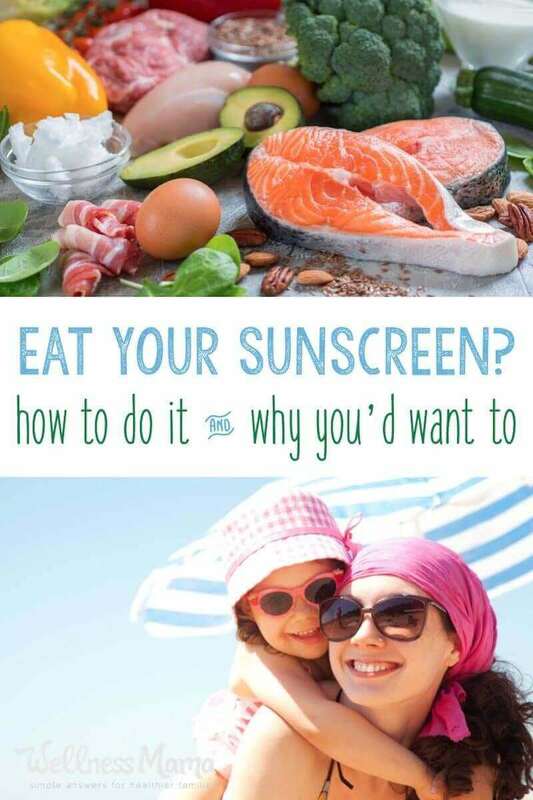 Because I now eat my sunscreen rather than just wear it. I’ve long been fed up with the ingredients in sunscreen (more on that in this post) and believe it often does more harm than good. The more I researched the more I found that exposure to the sun isn’t a problem (it’s actually a benefit) if you feed your skin the right nutrients to get it ready for sun exposure. There seems to be an underlying idea that sun exposure = skin cancer and that sunscreen = protection from skin cancer. But the research doesn’t back this up. In fact, it may susggest the opposite. Think about this: Skin cancer rates are rising despite more sunscreen use and reduced sun exposure in recent decades. This is the reason I don’t avoid the sun, but rather make a point to get sun exposure every day. I also avoid sunscreen for the most part, and just get out of the sun or cover up when I have had enough sun exposure for the day. I’m partially Irish-Scottish (which is Latin for very fair skinned!) and had always burned. In fact, even moderate sun exposure would leave me with a pinkish glow rather than a tan … until several years ago. The research showed the importance of sun exposure for adequate levels of vitamin D and many other aspects of health. Wearing sunscreen greatly reduces vitamin D production, so that wasn’t the answer. I decided to follow the research and start protecting my skin from the inside out. And it worked. I started working in the garden for hours at a time during the heat of the day without burning. We also went to Florida for vacation and I was at the beach for 4 hours between 11-3 with no sunscreen and I didn’t burn… at all! To those of you blessed with olive skin (like my husband), this may not seem like a big deal, but to me, this is huge! Finally I no longer look like the pale-stepchild among my Italian in-laws for the first time. Just as a poor diet has a negative effect on skin and overall health, a real food diet may offer protection from various health problems, including sun-related ones. Fortunately, the diet and lifestyle factors that are good for the skin have great benefits for general health as well. Note: This is what worked for me and is in no way medical or dermatological advice. Please do you own research, know your own skin, and find what works best for you. A large part of my natural sun protection is eating an anti-inflammatory diet. To make sure the body has the proper building blocks for healthy skin and to reduce inflammation, I consume enough healthy saturated, monounsaturated, and omega-3 fats while avoiding polyunsaturated fatty acids and high omega-6 vegetable oils. I focus on making sure that my diet is high in micronutrients from vegetables, omega-3s, and fat-soluble vitamins from fish, and monounsaturated and saturated fats from plant and animal sources. Just by avoiding grains and omega-6 oils as well as focusing on proteins, fats, and vegetables instead, your diet will be higher in antioxidants than the standard American diet. Even real food “treats” like berries and dark chocolate are packed with antioxidants. Antioxidants help reduce inflammation and free radicals. Research has shown a strong protective effect of antioxidants against inflammation and skin damage. I’ve noticed the biggest difference in how I feel from optimizing two things: omega-3 consumption and vitamin D levels. I talked about the importance of omega-3s above. Through blood testing, I found that my 25(OH)D level (one measure of vitamin D) was below 25 ng/mL. That was well below the recommendation for pregnant and nursing women and well below the 65 ng/mL recommended by some doctors for optimal health. Through years of experimenting and continual testing, I found that in order to get my levels above 30 ng/mL I had to get sun exposure and take supplemental vitamin D. Now, with my levels in the 50-60 ng/mL range, my thyroid is doing great and I feel the best I’ve ever felt. I also don’t get sunburned any more! Why it works: This is a logical if you think about it. Melanin, the dark pigment that we get when we tan, is produced to shield the skin from further UV exposure by providing a type of barrier. This is why those with darker skin need more sun that those with fairer skin to get the same amount of vitamin D.
When the body has enough vitamin D, it will start producing melanin to keep from getting too much. There is evidence that optimizing vitamin D levels through sun exposure and even through supplementation will help the body produce melanin faster and retain it longer. Of course, this is a genetic and very personalized issue that is best handled with testing and the help of a qualified practitioner. Seems simple and logical, but moderate and safe sun exposure has the most benefits for vitamin D levels. Sunburn is never good! I always get less sun exposure than I think I need at first and work up really slowly to avoid burning. With the recent research on the benefits of sun exposure and the potential harmful substances in many sunscreens, I choose natural ways to protect from the sun once I’ve gotten enough exposure at any time. My first (and best) option is just to cover up or get in the shade if possible. A hat and shirt are reusable, don’t contain harmful chemicals, and do a great job of protecting from excess sun exposure. If I have to be outside in the bright sun for extended periods of time and can’t seek shade or cover up I’ll sometimes use a natural homemade sunscreen or an EWG-recommended sunscreen. This time of year, I also start taking a specific regimen of supplements to help reduce inflammation and improve sun tolerance. I’m not a doctor and don’t play one on the Internet, and I’m only sharing the supplements I personally take and why. Check with your doctor before making any health or supplement changes, especially if you have any medical conditions. Vitamin D3 Drops – I take about 2,000 IU/day with sun exposure to keep my levels up. Those drops are 2,000 IU per drop so a bottle lasts us a really long time. I also test my levels a few times a year and stop taking D3 if my levels are high enough. Vitamin C – I take about 2,000 mg/day. Vitamin C is a potent antioxidant and also has many other benefits to the body. Omega-3s and Krill oil – I’ve experimented with several different brands over the years. I’m currently trying these capsules at the recommendation of Dr. Rhonda Patrick in a recent podcast episode, and I like them so far. Astaxanthin – A highly potent antioxidant which research shows acts as an internal sunscreen. It’s also supposedly an anti-aging supplement. I don’t give this one to the kids though. Sundots – These tasty gummies help boost skin’s ability to resist solar damage. They contain polypodium leucotomos extract, a fancy name for a fern long used in parts of the world for sun protection. Avoid sunburn from the inside out and the outside in with nutritional support and a hat + rash guard. Take these measures a month or two before beach season starts and condition your skin to love the sun. 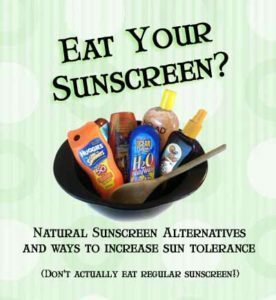 It’s good for your health anyway and saves money on sunscreen! 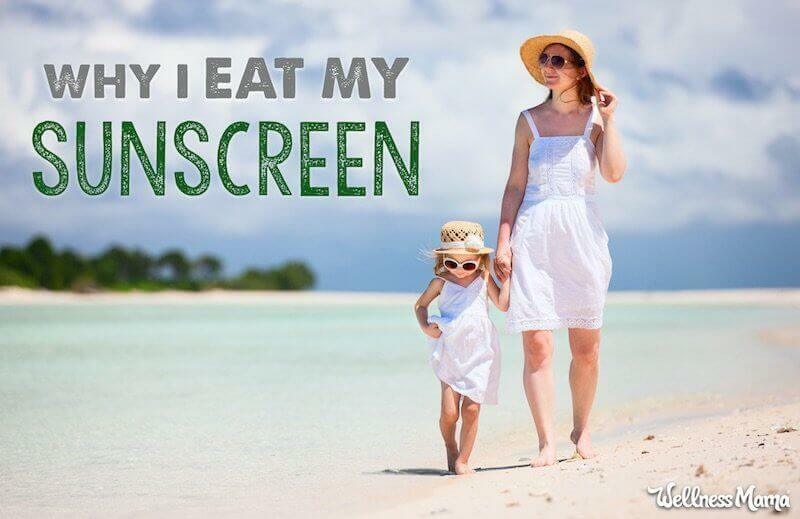 Do you eat your sunscreen? Still use the toxic stuff? Avoid the sun completely? Tell me below!